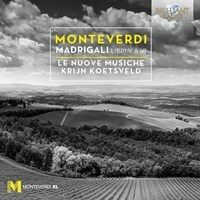 Under its founder-director Krijn Koetsveld, Le Nuove Musiche has won international acclaim for its complete recording of Monteverdi’s madrigals, a project over a decade in the making and which has recently been released complete for the first time by Brilliant Classics (BC95661). 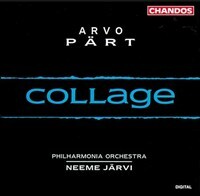 Now the ensemble turns its attention to a modern master of concerted vocal writing, Arvo Pärt. The idioms of the two composers could hardly be more different: Monteverdi’s madrigals so rich and elaborate, speaking of earthly love and pain, while Pärt evokes a world of stillness and calm. As Koetsveld remarks in his booklet introduction, his music seems so simple. Only a few notes, repeated harmonies, often extremely quiet tempo, declamation on a note or chord. No complex patterns, with many surprisingly dissonant harmonies or highly complex vocalizations. Where does that intriguing, intoxicating atmosphere come from which many cherish and enrapture? In the Magnificat of 1989 Pärt draped the text in a free declamatory style, on a note, or a dissonance or a simple harmonic world He expresses the Marian hymn softly, almost timidly, as if the defining vision of the text is of Mary, quietly rejoicing at the news that she carries within her the son of God. The Nunc dimittis was composed separately, 12 years later, but its unhurried unfolding of the Song of Simeon complements the Magnificat perfectly. 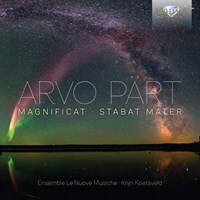 The Seven Magnificat Antiphons (1988, 1991) and the Stabat mater (1985) both employ fewer notes in the service of a more austere soundworld, one which may cast the listener back to the vast spaces of a medieval cathedral and the daily offices held therein. For 25 minutes the Stabat mater dwells hauntingly within the Aeolian mode as if in musical imitation of Mary, quietly lamenting her son at the foot of the Cross. 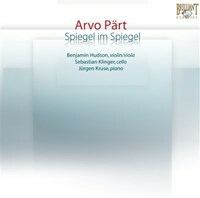 Both of them exercise an immense power upon any receptive listener, and this new recording is sure to capture the imagination of Pärt’s many followers worldwide. 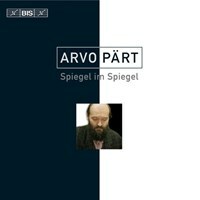 Arvo Pärt (born 1935) is without doubt one of the best-known and –loved composer of today. His highly personal style, influenced by Gregorian Chant, is based on slowly shifting patterns, tintinnabuli (little bells), creating a meditative and hallucinatory effect, a visionary world of spiritual contemplation. Pärt’s sacred choral works enjoy a huge popularity with both the traditional classical audience as well as an open-minded new generation. This new recording presents two of Pärt’s choral masterworks: the Stabat Mater and Magnificat, as well as the Maria-Antifonen and the Nunc Dimittis, all dealing with the complex emotions of Maria, Mother of God, in deepest sorrow and bliss. Excellent performances by Le Nuove Musiche, conducted by Krijn Koetsveld, who delivered a remarkable achievement in recording the complete Madrigals by Monteverdi for Brilliant Classics. Their experience in performing Renaissance vocal music is paying off in these deeply felt performances of 20th century choral masterworks. Om du tycker om Magnificat; Stabat Mater, berätta det gärna för dina vänner! Du kan snabbt och enkelt dela denna sida direkt på Facebook, Twitter och via e-post här nedanför.